Gobalfoundries revealed it plans to produce test wafers using the hybrid 14nm eXtreme mobility (XM) process technology as soon as in the first or second quarter of 2014. Additionally, Mike Noonen, executive vice president of worldwide marketing and sales, revealed that 14XM multiproject wafer (MPW) runs could take place in the first or second quarter of 2013 and would be used by early adopters to run test circuits. However, X-bit Labs reports AMD will not be able to profit from the rapid move to 14nm XM FinFET technology because the process is not tweaked to support silicon-on-insulator wafers, a crucial technology for AMD's CPUs. 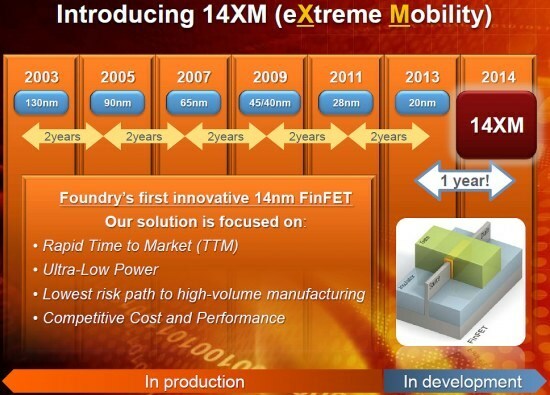 Globalfoundries positions its 14m XM manufacturing technology for those adopters of 20nm LPM manufacturing process who need additional performance and power saving, but not space and cost savings. The technology could be ideal for AMD, which is struggling to deliver competitive products on the market, but 14nm XM will not be tweaked to support silicon-on-insulator wafers, a crucial technology needed to manufacture AMD central processing units, and will remain bulk only. Globalfoundries seems to have a clear roadmap for both SOI as well as fully-depleted SOI at 28nm and 20nm. But those technologies use traditional planar transistors, not innovative FinFET transistors, which means that AMD will not be able to match Intel’s performance and power saving capabilities (Intel claims that tri-gate transistors enable 37% higher speed, or 50% lower power consumption compared to planar transistors) in the foreseeable future; at least, till Globalfoundries and its partners develop ultra high-performance 14nm process technology.